This morning I’m writing to you from the Einstein Bros in downtown Columbus. I’m on jury duty for the rest of the week, so it’s a bit of a change in routine for me. I’m not a giant fan of real rush hour traffic (I drive in the “opposite” direction for my regular job) so I’ve been getting down here pretty early, which gives me time to walk around and take in this city I’m trying to write about. I’ve lived in Columbus for 23 years, since I was five years old, but in many ways the downtown is a mystery to me. 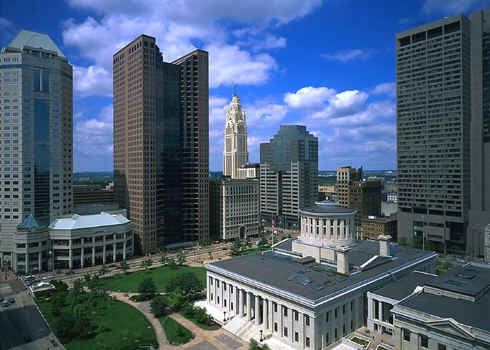 Columbus is really three cities: downtown, OSU Campus, and the suburbs. Some of those suburbs are now the “exurbs”, a mixed conglomeration of municipalities and jurisdictions with no clear government to appeal to for services. OSU Campus culture bleeds into everywhere, as this is a town obsessed with college football. And the downtown area is going through a revival, with the Columbus Commons, Scioto Mile and potentially a new Vets Memorial, this is an exciting time to be living in this city. I’ve placed my character in the Short North, an area between Campus and Downtown, the perfect blend of both cultures with the cosmopolitan hipster attitude on the one hand, and the arts, cheap bars, and good food of the other. Even getting him a good cup of coffee is tricky, as he’s decidedly not a “hipster” and yet he isn’t going to stoop to White Castle coffee. The more I write him, the more I wonder exactly why he’s living where he is, and yet it’s the “fish out of water” quality (even in his own home) that I think will help him be a good surrogate for the reader in getting to know “my city”. Columbus is the state capitol, home of a nationally talked about (if not national championship playing) football team, and a world-class university. It’s got one of the largest Somali refugee populations of any American city, and is one of the more gay friendly cities, especially in the midwest. And Ohio’s a swing state in elections so we’re talked about nationally at least once every four years. I started with writing Sci Fi, and I will continue to come back to it. But one of the joys of working on this mystery has been the excuse to research where I live, to really become a native as opposed to someone who just lives here. It’s a different kind of work. Instead of making everything up from scratch, I’m doing a lot of research, walking the streets with Google maps, looking up websites, and taking pictures wherever I can. Every city has a story, every city has a culture. And I’m happy I’m setting my story here, and not in New York, Washington, LA or San Francisco. One day I might even write about Youngstown, which back in the day was Bombtown, USA. This is a territory mystery writers have been treading for a while, writing the city they know, giving readers an authentic view of their world. Hopefully, you’ll get some of that from me when you finally read Surreality. The more you talk about setting your story in Columbus, the better an idea I think it is. The realism will be helpful, and it’s already challenging you to think about your characters in new ways. Excelsior!